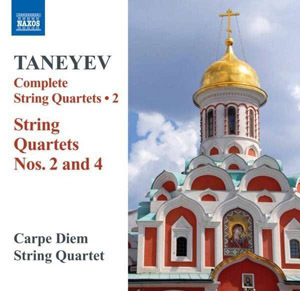 What a luxury for Taneyev fans that there are now two complete string quartet cycles available on CD. Even better, they are both to a very high standard indeed. The competition is from the Taneyev Quartet, whose late 70s St Petersburg recordings are now available on CD transfers from the Northern Flowers label. But one thing the Taneyev Quartet cycle does not do is couple the Second and Fourth Quartets. Given that they are the two finest works in the cycle, this disc is therefore to be recommended to Taneyev newcomers simply on account of its programming. The playing here is also excellent. It is always difficult to pin down the stylistic threads of Taneyev's chamber music, at one moment he is in a quasi-medaevil polyphonic mode, in the next he has whipped up a Russian folk dance or an elegant Beethovenian scherzo. The Carpe Diem Quartet have the edge over the Taneyevs with this faster, livelier music. They are also better at those immediate changes of tempo and mood. So, for example, the Scherzo of the Second Quartet and the Finale of the Fourth really sparkle in this recording, and the players give a sense of inner drive to the music that enables Taneyev's occasionally wayward forms to tightly cohere. The slow passages, the Adagio third movements of each quartet, and the introductions to many of the others, are treated here as chamber music without any real attempt to expand the sound or the conceptual dimensions of the works. That is a perfectly legitimate approach, but contrasts the Taneyev Quartet's performances, which aim for a more symphonic palette, and usually achieve it. The balance in the Carpe Diem recording is more top heavy than in the Taneyev Quartet version. In the earlier recording, that may be the result of higher harmonics being removed to avoid noise from the analogue recording. Then again it may not, because the sound reproduction on those discs is otherwise excellent, and suggests little doctoring at the transfer stage. Here, the violins clearly have the edge over the viola and cello. That can occasionally be a problem, as Taneyev makes creative use of the bottom end of the ensemble, and when we hear a mid-range cello solo, for example, the accompanying violin figures often threaten the balance. But I'd be hard pressed to recommend the Taneyev Quartet readings of these works over this disc. There is just so much beautiful music making here that really deserves to be heard. Taneyev remained a repertoire figure throughout the history of the Soviet Union while he was all but forgotten in the West, so it is unsurprising that the Taneyev's give a dutiful and respectful performance, while the Carpe Diem's present the music as if it is a completely new discovery. Hiring a young string quartet for recording projects like this can be risky. But as this disc shows, it can also pay off handsomely. A strong recommendation, then, even to those who have never heard Taneyev's name before. If you like Tchaikovsky's strings quartets, you're sure to love this.